Hello my new reality. After very successfully avoiding it for 7 years (6 spent studying and 1 doing exhilarating short internships with the Media24 Journalism Academy), the real world has finally caught up with me. I am now a fully fledged adult, with an office job. Fortunately it’s not a bad one at all, as I get to write about travel and interact with all kinds of interesting people. As you can see from the above picture, my in- and out-boxes are still quite empty, but seeing it’s only my second day at work I’m sure things will pick up as the year progresses. It is also only the 4th of January, so I’m guessing most people are still on leave and enjoying their holidays (I hate them so much right now). 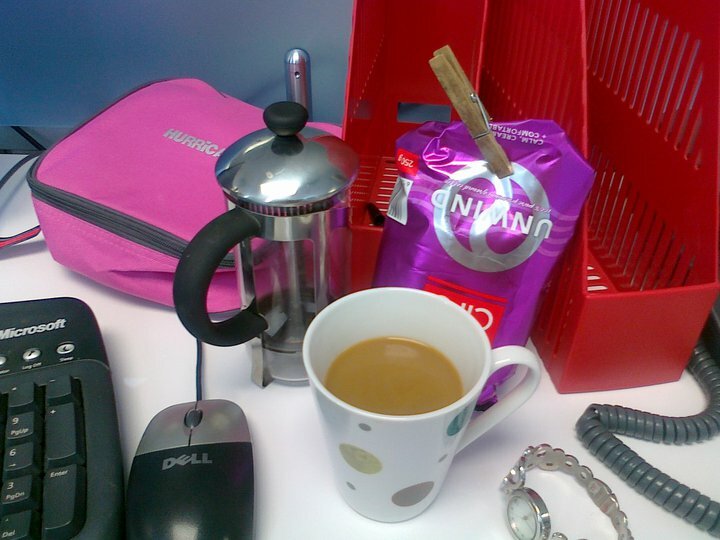 At the moment the lonely red inbox is housing the tiny plunger I got for my birthday in December and my Ciro Unwind coffee (also seen in picture). It’s been a quiet first two days of work, for which I think I can be very grateful! Imagine having to kick off a new job in the midst of all kinds of hectic schedules. As it is, I’m easing into my new position and enjoying getting to know the new environment! Hye bru! you should put on a updated photo of your desk, with in- and out-boxes! Good idea! It’s quite chaotic now… keep you eyes peeled, bru!